It’s that time of the month again to acknowledge what matters most here at Thrift Diving: the readers! I’ve said it before, and I’ll say it again: a blog would be nothing without its readers. So I like to take a moment to share with you someone who I think deserves the spotlight. 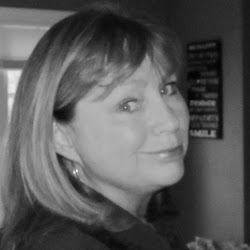 This month I chose someone who already has her own spotlight: a fellow blogger and friend, Gail, from the creative blog My Repurposed Life (she also hosts a super helpful, popular podcast called DIY with MRL (you can listen for free on iTunes). 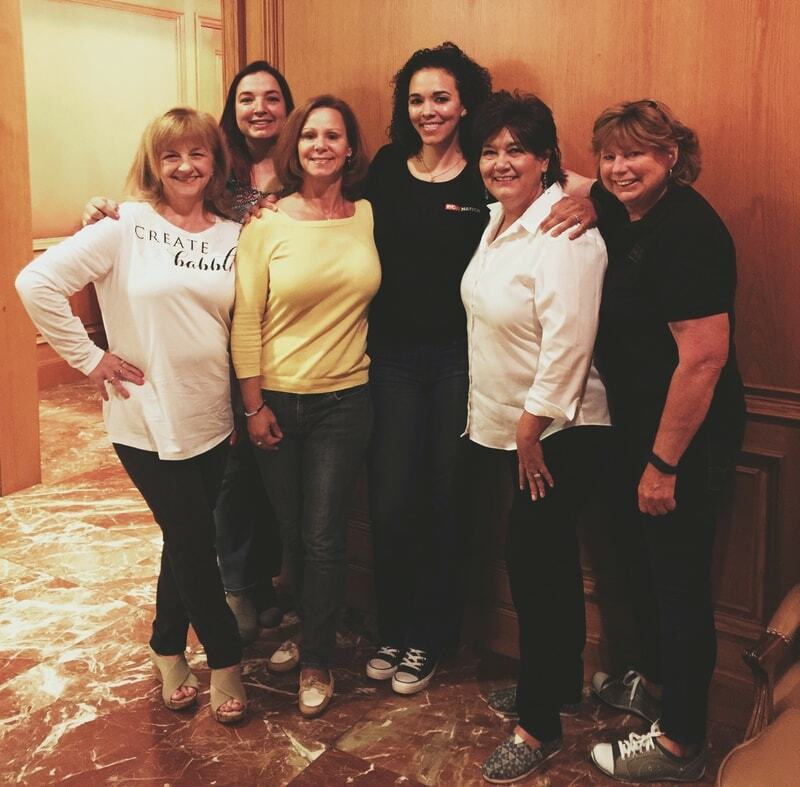 Over the years, I’ve had the joy of getting to know Gail–through blogging conferences, Facebook, and a year ago, we created a mastermind group with several other bloggers to support and encourage each other to improve our blogs and businesses (here’s a recent picture of several members of our mastermind group at the SNAP creative blogging conference Spring 2016). But here’s why I chose to shine my own spotlight on Gail: because she actually cares and supports fellow bloggers. You see–this is what happens most times when you become a busy blogger: you’re so wrapped up in trying to crank out your next project or post, that you forget you were once a blog reader. You’re now too busy to go readin’ anyone else’s blog, including your friend’s blog. Heck, you can barely keep up with your own blog! Despite how busy she is with her own project load, she actually takes time out of her busy schedule to read all her favorite blogs (including Thrift Diving), and–gasp!–leaves comments! To see Gail’s reply pop up in the comments section, knowing that she’s just as busy as the next blogger, makes you understand how thoughtful her comments truly are. She has supported Thrift Diving from the moment we met in line at the Haven Conference several years ago (Haven is a DIY blogging conference). I can’t thank her enough for being so down-to-earth and thoughtful. I was born in Louisville, KY and have resided in the same part of town my entire 59 years! I’m a south end kinda girl. How long have you been thrift diving and loving junk? Since my sister and I grew up with a single mom, living with her parents off and on, I’ve always needed to be very frugal. We very much needed to watch our pennies, so for me, it’s been a way of life. I can’t say I remember my mom picking up anything from the side of the road, but I think that back in the day that sort of thing didn’t happen often. My mom was always into DIY, changing up furniture. I remember her doing “antiquing” on furniture when I was a tween to update some old pieces that were second hand. I have been doing it more in the last 10 years or so due to my own personal circumstances. After losing my job and my marriage falling apart, there was definitely some “belt tightening” going on around here. 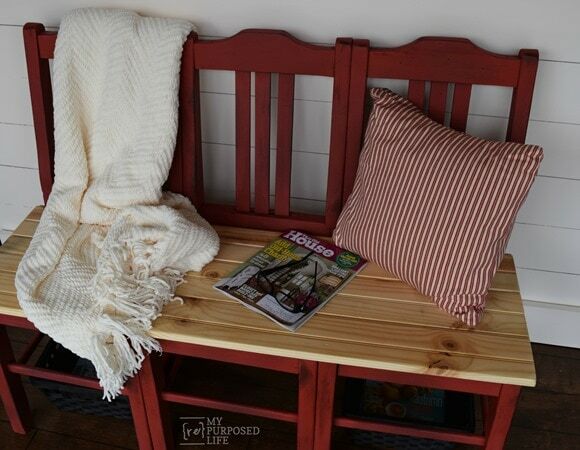 Click here to see Gail’s gallery of DIY projects and repurposes made with old chairs, cribs, headboards, and more! Asking which project I’m most proud of is sort of like asking a mother to choose her favorite child. Each project is so different. My FIRST large DIY after becoming responsible for my own home was my Ugly Fireplace Makeover. 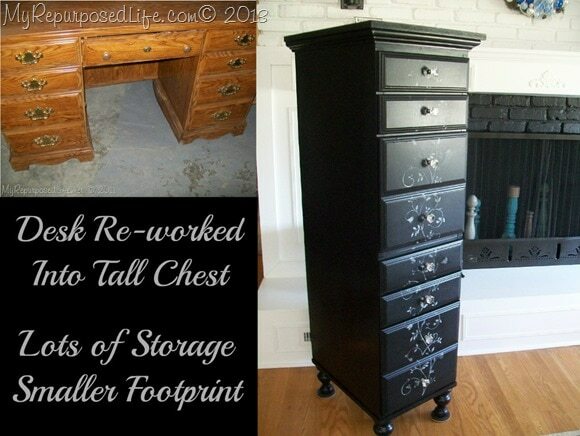 It was not quite the same as repurposing furniture items. I also updated my kitchen on a very tight budget. Lastly around the house, I did my DIY Picket Fence that seemed like it would never end. Two of my proudest DIY franken-furniture pieces were desks that I turned into a Kitchen Island/Craft Center and a Tall Lingerie Chest. I sell the majority of my projects but have kept both of those. What’s your most prized possession you’ve ever bought from the thrift store? I don’t have a lot of room in my small home, so I don’t buy many pieces for myself. 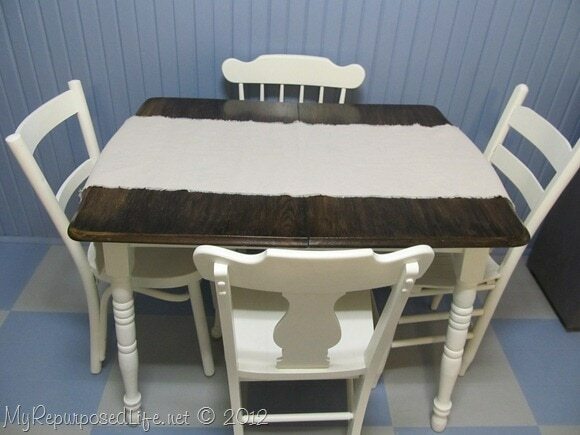 My best deal that I got (and kept) was my kitchen table for about $25. Why do you like reading Thrift Diving, and how long have you been a reader? I love Thrift Diving for all of your tips! Oh, and of course your great videos. And don’t forget the fabulous room makeover challenges! One of my favorite videos is of you stenciling your bathroom cabinet, holding the stencil with your foot! I can’t even remember when I started reading Thrift Diving. I do remember that when I saw you at Haven Conference the first time, that I was star struck and so happy that you knew who I was. What other DIY, thrifting, or crafting blogs do you love to read? I’m a Google Reader fan, but now that it’s gone, I use THE OLD READER, and I subscribe to too many blogs! I have about 40-50 blog subscriptions, but I’ve been so busy lately that I have 237 entries to read at this time. Of course, Thrift Diving is on the top of that list as well as Refresh Restyle, My Love 2 Create, and Bliss Ranch because she makes me laughs. But the list is really endless!!! I get so much inspiration from my blog friends (and PINTEREST). Thanks for joining me for this month’s Reader of the Month here at Thrift Diving! Gail is an inspiration to all of us Serena. She can make something beautiful out of weeds. And in very unexpected ways. And we would be nothing without our readers. In my case, I have learned so much from all of you, and that is why I decided to try my hand at blogging too. Off to get sucked into her blog. Also, I’m glad she pointed out you using your foot to hold up the stencil… hilarious! Gail is a great inspiration. I’ve only been following her a short time, but she has some great ideas. And I agree with Lisa, it’s wonderful to see women encouraging women. You, Gail and others form a great team and are an inspiration to me and many others, I’m sure! 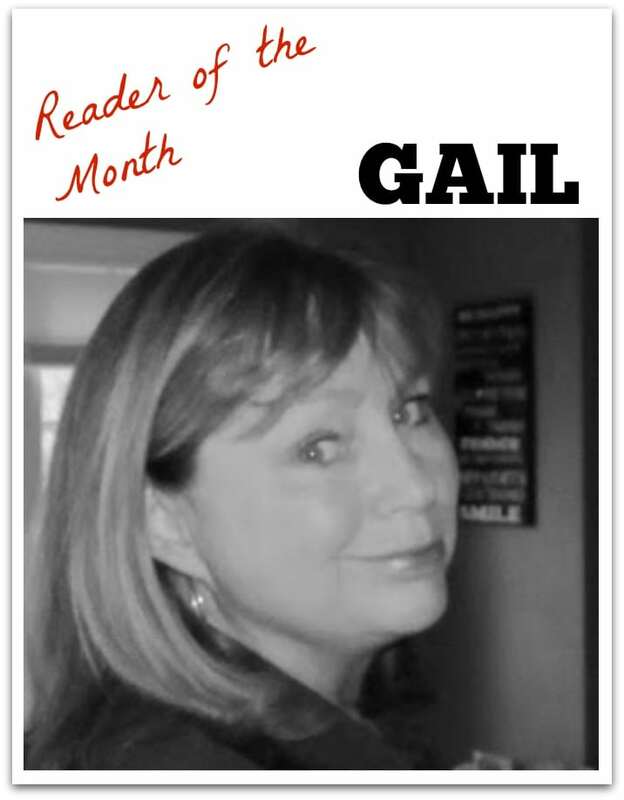 Loved this post and love Gail too! I don’t know how she stays so consistent commenting and reading all the other blogs. Good questions too, I enjoyed getting to know here a little more! Thanks, Wendi! 🙂 And I’ve learned some great tips on her podcast, too! I love Gail. I’ve been reading her blog for a few years. So great to see women supporting and encouraging other women.